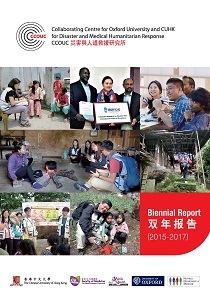 The booklet summarising CCOUC's activities from 2015 to 2017 is now available for downloading. This publication consists of 40 diverse case studies regarding multi-stakeholder and participatory approaches in DRR, with particular focus on the science, technology and academia contributions. This publication provides trainers for volunteers and organisers of rural projects with advanced practical guidelines for implementation of health and disaster preparedness programmes. This publication provides volunteers and organisers of rural projects with practical guidelines for implementation of health and disaster preparedness programmes. Different sensitivities to ambient temperature between first- and re-admission childhood asthma cases in Hong Kong – A time series study. Environ Res. 2019; 170:487-492. Is urban household emergency preparedness associated with short-term impact reduction after a super typhoon in subtropical city?. Int J Environ Res Public Health. 2019;16(4):596. Health-emergency disaster risk management and research ethics. Lancet. 2019;393:112-113. Effectiveness of a drama-and-song-based health education in increasing knowledge on household waste management in Manchu ethnic minority-based Dacao Village. International Journal of Behavioral Medicine. 2018; 25 (supplement): S181. Food avoidance beliefs and behaviors among Chinese cancer patients: validation of a new measurement tool. Journal of Nutrition Education and Behavior. 2018. Long-term and immediate impacts of health emergency and disaster risk management (Health-EDRM) education interventions in a rural Chinese earthquake-prone transitional village. International Journal of Disaster Risk Science. 2018; 9(3): 319-330. Risk perception and knowledge in fire risk reduction in a Dong minority rural village in China: A Health-EDRM education intervention study. International Journal of Disaster Risk Science. 2018; 9(3):306-318. Medical and health risks associated with communicable diseases of Rohingya refugees in Bangladesh 2017. International Journal of Infectious Diseases. 2018;68:39-43. Building bottom-up health and disaster risk reduction programmes. Oxford: Oxford University Press; 2017. Socio-demographic predictors of health and environmental co-benefit behaviours for climate change mitigation in urban China. PLoS One. Published online 2017 Nov 27. Disaster prevention, monitoring and warning for mass events. In: Liu ZM, editor. Current medical assistants of the city disaster. Beijing: Tsinghua University Press; 2018: 38-40. Chinese. Urban community disaster and emergency health risk perceptions and preparedness. In: Shaw R, Shiwaku K, Izumi T, editors. Science and technology in disaster risk reduction in Asia: potentials and challenges. London: Academic Press; 2017: 95-110. Field assessment for disaster. In: Liu ZM, Zhang LY, editors. Handbook of disaster injury emergency treatment techniques for primary care physicians in China. Beijing: Chinese Medical Multimedia Press; 2016: 12-19. Chinese. Health and risks: integrating health into disaster risk reduction, risk communication, and building resilient communities. International Journal of Disaster Risk Science. 2017;8(2):107-108. What are the health research needs for the Sendai Framework? The Lancet. Published Online 2017 June 19. doi: 10.1016/S0140-6736(17)31670-7. Public health humanitarian responses to natural disasters. London: Routledge; 2017. A study of the short-term associations between hospital admissions and mortality from heart failure and meteorological variables in Hong Kong: weather and heart failure in Hong Kong. Int J Cardiol. 2017;228:537–42. The solidarity and health neutrality of physicians in war & peace. PLoS Curr Disasters. 2017. The development of the Hong Kong Heat Index for enhancing the heat stress information service of the Hong Kong Observatory. Int J Biometeorol. 2016 Jul;60(7):1029-39. doi: 10.1007/s00484-015-1094-7015-1094-7. Epub 2015 Nov 6. Accredited qualifications for capacity development in disaster risk reduction and climate change adaptation. Australasian Journal of Disaster and Trauma Studies. 2016 Sep;20(1):15-34. Role of government and NGOs. In: Wolfson N, Lerner A, Roshal L, editors. Orthopedics in disasters: orthopedic injuries in natural disasters and mass casualty events. Springer-Verlag Berlin Heidelberg; 2016: 47-59. 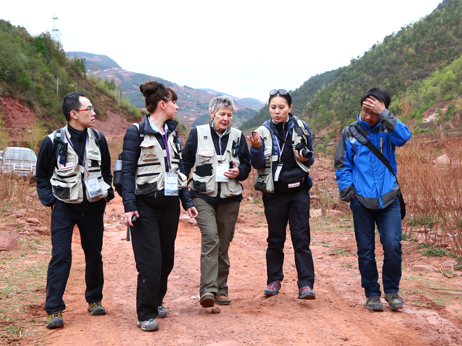 Health and disaster preparedness in rural China: Advanced training manual. Hong Kong: CCOUC and WZQCF; 2016. Traditional Chinese. Training Manual on Health and Disaster Preparedness in Rural China. Hong Kong: CCOUC and WZQCF; 2016. Hong Kong’s emergency and disaster response system (policy brief). Hong Kong: CCOUC; 2015. 6 p.
Willingness of future A/H7N9 influenza vaccine uptake: A cross-sectional study of Hong Kong community. Vaccine [Internet]. 2015 Jul 27. Public health and liberal studies: analysis of cross-module issues. Hong Kong: Hong Kong Educational Publishing Company; 2015. Training Manual on Health and Disaster Preparedness in Rural China. Hong Kong: CCOUC and WZQCF; 2015. Chinese.